Washington Square Park in Philadelphia. People watching is the perfect pastime in Philadelphia: It doesn’t cost a thing, you can do it on your own schedule and it’s a great excuse to separate yourself from your phone for a while. Whether you need to clear your head after a busy morning at the office or are in search of inspiration for your latest creative project, getting lost in the world around you is a great way to find yourself again. Here are five of the best places for people watching in Philadelphia. While many associate Rittenhouse Square Park as a prime place for people watching, it can get awfully crowded and finding a place to sit, especially on the weekends, can be challenging. 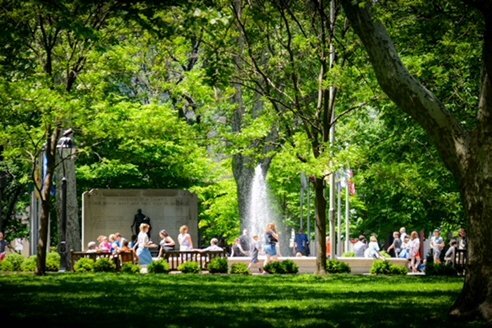 Washington Square Park in Society Hill offers the beauty of Rittenhouse Square Park with a slightly calmer atmosphere. Grab a hand-rolled ice cream from Sweet Charlie’s, plop yourself down on a bench and look on as locals walk on by. 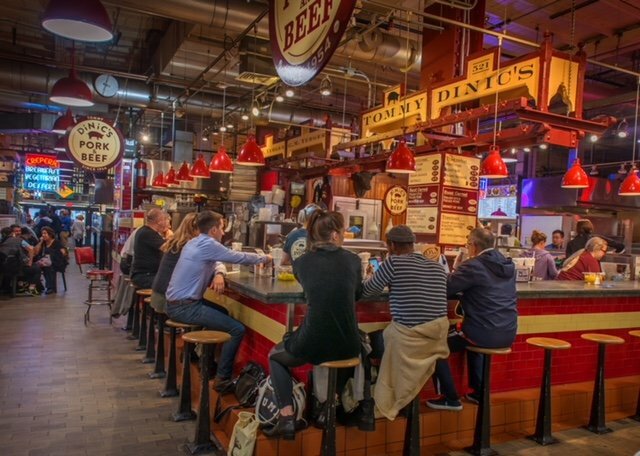 Dinic's inside Reading Terminal Market. One of America’s largest and oldest public markets, Reading Terminal Market will give you a nice mix of locals and tourists alike. After picking up something to eat, make your way to the food court where you’ll have a front row seat to the endless parade of people passing by – as well as their food selections. Or, if you’re lucky, find a seat at the counter at Dinic’s and get your fill of people watching as you nosh on a roast pork sandwich. 16. 124 S. 13th St.
Getting a seat can be tricky, but dining outdoors at Sampan is one of the best ways to people watch in Philadelphia. With 13th Street being such a charming thoroughfare chock full of excellent restaurants and shops, the action never stops. What’s more, with Sampan’s menu of Pan-Asian fare, you’ll have every reason to keep eating and drinking as you gape away. Known to many as the heart of South Philly, the Singing Fountain is where the community community comes together, whether it’s a holiday or not. From locals who grew up in the neighborhood to newcomers who now call it home, you never know who you’ll see gathered around the fountain. Take your coffee to go from Black n’ Brew, plop down on a chair and have a stellar time people watching at the Singing Fountain. Who knows, maybe you’ll even make a new friend? 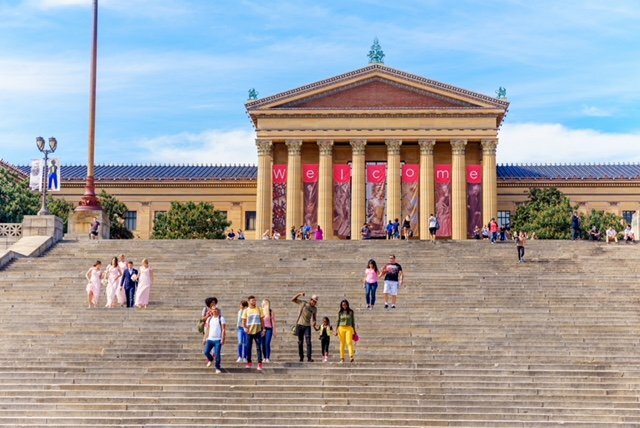 The steps of the Philadelphia Museum of Art. Once you’ve run up the Art Museum steps, you’ll probably want to sit on them for a much deserved breather. You’ll soon discover that this spot is not only a gem for people watching, but you can also get a fantastic view of the whole Benjamin Franklin Parkway. Bring your favorite music or podcast and zone out as you watch art aficionados as well as fitness junkies ascend and descend the steps.